"He has dethroned the king!" Major League Eating commissioner and competition emcee George Shea, donning his signature straw boater hat and navy blue suit, ditched the circus announcer cadence last year to proclaim the shocking end of a great American championship reign: that of Joey Chestnut, eight-time defending hot dog eating champion and conqueror of legendary Japanese renegade Takeru Kobayashi. A young usurper, Matt "Megatoad" Stonie, devoured 62 hot dogs in ten minutes to Chestnut's 60. The 24-year-old with a last name that probably aptly describes his college dorm room was born and raised in San Jose, no doubt dreaming of one day defeating Chestnut, his hometown's favorite son. And so the young American with long black hair corralled by a headband revealed himself to be the ghost of Kobayashi, and in the process may have awakened a sleeping beast the likes of which the competitive eating circuit has never seen. Less than a year after proposing to his girlfriend on national television, Chestnut saw his engagement disintegrate in the weeks leading up to the 2015 competition. He aws eating while his heart lay in pieces, occupying valuable real estate inside his torso. Chestnut's redemption tour reaches its apex on Coney Island this Fourth of July, a holiday he once owned. Fresh off setting records for gyros and pork rolls, the former "boy king" now sports a worn face and an unkempt beard, like Ron Burgundy after his unceremonious departure from KWVN Channel 4. There is valor in his eyes, a singular focus gained only when a man is pushed to his mental and physical limits. 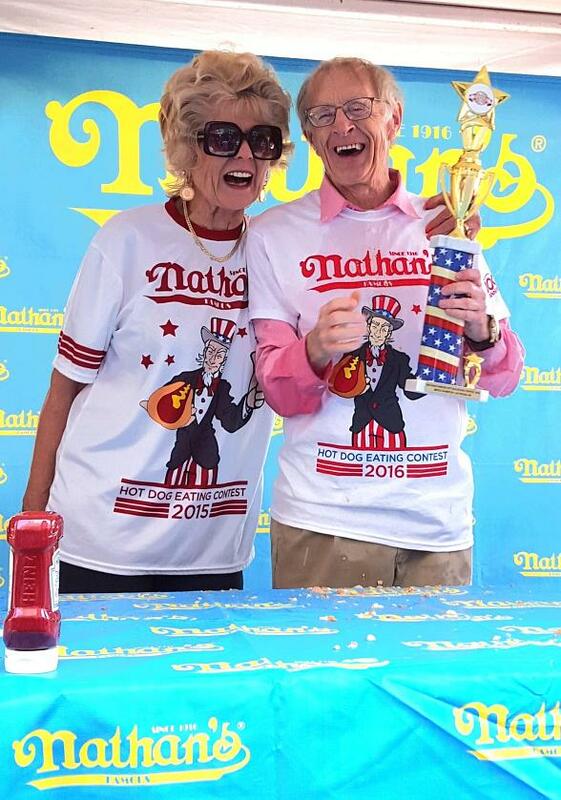 “I want Matt to know he can’t win,” Chestnut told The Washington Post after ravaging 73.5 hot dogs, his highest mark yet. If Stonie is to defend his throne, he will need much more than strong will and a smooth esophagus. He will need to slay an angry dragon. Morgan achieved fame the way most people do these days: by eating more peanut butter and banana sandwiches than anyone in Biloxi, Mississippi. In the six years since, the LSU graduate with a very LSU haircut has slowly risen to #4 Major League Eating's rankings. White Rick Fox might look like your thrice-divorced uncle who retired young and lives on the lake, but don't confuse his relaxed vibe for a lack of ferocity. That ratty Red Sox cap is very likely a good luck charm, responsible for his consistent ~30 HDB performances, including 30.5 in his first-ever contest. The exceedingly jacked Esper wolfed down 23 pepperoni rolls in ten minutes to win a recent event at West Virginia's Three Rivers Festival. His stomach should be sufficiently stretched to leave his mark among the big boys. In just his second year on the circuit, the former Division II basketball player has risen from #24 into the top ten of MLE's rankings, thanks mostly to a 50% increase in competition production. Hailing from Atlanta by way of Basawa, Nigeria, Oji once downed 43.5 ears of sweet corn in 12 minutes, which is about 41 more than this Iowan has consumed in his entire life. Rich LeFevre, one half of this adorable competitive eating couple, lives just outside of Las Vegas and stuffs his face with buffalo wings while wearing tucked-in Philadelphia Eagles jerseys, surrounded by bikini-clad women cheering him on. If that's not the American Dream, I don't know what is. Should The Locust achieve the impossible and win this year, he's a shoo-in for the new "Most Interesting Man In The World." Eating stats are secondary for the competition's Latin heartthrob, personal trainer Juan Rodriguez. Look at that raised eyebrow. Bet you're not thinking about hot dogs. Also: "Juan More Bite" belongs in the Nickname Hall of Fame. This Weeknd knockoff has left a roomful of loudmouth sports talk radio hosts stunned by swallowing the entire Taco Bell diet drive thru menu in under two minutes. Even for a guy who's consumed 18 pepperoni rolls in ten minutes, that might be his most impressive feat. Here's a video of a shirtless Dud Light eating a dozen roses. Here's one of a shirtless Dud Light rapping about people subscribing to his YouTube channel. Dud Light is not a fan favorite. Eric Booker is not new to this eating game, not by a long shot. Badlands ate 19 donuts on Jimmy Kimmel Live in 2003 on an episode that also featured Obie Trice and a very uncomfortable Ben Stiller. Enormous in both height and weight, Booker also appeared on Wife Swap, during which a fitness freak introduced him to the concept of exercise. Seems like a nice enough dude, but his prime years are likely behind him. No quotation marks here. The guy really changed his name to Crazy Legs, one of many deadlocked white men to own such a moniker. Conti is a name brand in this niche sport, though he poses no threat to the throne and is mostly around to entertain the fans. Think Pete Weber. Crazy Legs once inhaled 3.5 pounds of sourdough pancakes and six pieces of bacon in 12 minutes and lived to tell the story. Poor Steven Schuster. Search his name, and the first results direct you to a plastic surgeon in Boca Raton. He'll have to set a personal record on the big stage to change that.